RIO DE JANEIRO: Netherlands captain Robin van Persie returns to the fray Sunday when his side take on a rejuvenated Mexico for a place in the World Cup quarter finals. The Dutch play Mexico in the last 16 in hot and humid Fortaleza at 1600 GMT, before Costa Rica take on Greece in Recife at 2000 GMT, with the latter two seeking their first quarter final place. Van Persie, who is three goals short of 250 in his career, missed the Netherlands' 2-0 win over Chile in their final Group B game through suspension. The Dutch finished as top first round scorers with 10 goals from three games. 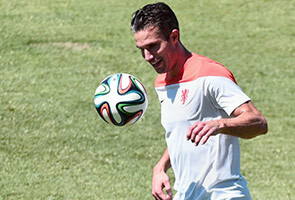 But as European teams are forced onto the backfoot by Latin American rivals in Brazil, the Netherlands will need all the scoring skills of Van Persie and his strike partner Arjen Robben. Leroy Fer, who scored against Chile, is injured and will definitely miss the game. Dutch coach Louis van Gaal is also worried about the Fortaleza heat and is demanding that water breaks are held. Mexico only clawed their way into the finals through a playoff, but showed their determination in a 0-0 draw with favourites Brazil in Group A.
Goalkeeper Guillermo Ochoa has been a revelation. But there has been just as much attention on Manchester United striker Javier "Chicharito" Hernandez, who has started every game on the substitutes bench. Hernandez came on to score against Croatia -- ending a year-long international drought -- and Miguel Herrera has praised his attitude. But 'Chicharito' will start the Netherlands game on the sidelines again. Herrera said the players who have got Mexico this far deserve to keep their places. Either Costa Rica or Greece will reach the quarter finals for the first time at the end of the clash of the underdogs. Costa Rica sensationally beat Italy and Uruguay and drew with England as they topped Group D. Georgios Samaras scored a penalty in the third minute of injury time to give Greece the points they needed in their last Group C game to get the second qualifying place. Costa Rica midfielder Michael Barrantes said everyone must now be wary of the world number 28th ranked team. "We came here to write football history for our country. We came in as the underdogs, now everybody knows who Costa Rica is," he said. "We don't know how far we can go, but we are focused on going as far as possible. The team is calm, but we're not too relaxed." This will be Costa Rica's second appearance in the round of 16 in four participations at World Cup finals. The last time, in 1990, they were beaten by Czechoslovakia. Greece scored only two goals in their three group games and reinforced their ultra-defensive reputation. That annoys coach Fernando Santos, who insists the team are expert counter-attackers as well. That may not worry the Greek nation as it enjoys the World Cup progress while battling their way out of economic crisis. "I am delighted first of all that we bring joy to the Greek people," said Santos. If Greece win, its federation may face an immediate problem as Santos's contract runs out on Monday. He has said he will not make a new deal but is expected to stay on until the team's last game.